Low-carb dieting can be a very effective way for some people to lose weight. Often, however, lack of variety causes people to quickly drop off low-carb plans. Having an arsenal of tasty low-carb recipes can help you stick to a low carb lifestyle. The amount of carbs you ingest per meal on a low-carb lifestyle varies depending on the program you decide to follow. In general, diets are considered low-carb when they have fewer than 100 grams of carbs per day. However, some diets, such as the Atkins diet, restrict carbs to as low as 20 grams per day in their early phases. The following low-carb recipes limit carbs to fewer than 20 grams per serving. Breakfast can be a challenge for people living the low-carb lifestyle because so many people rely on high-carb grain products to start their day. 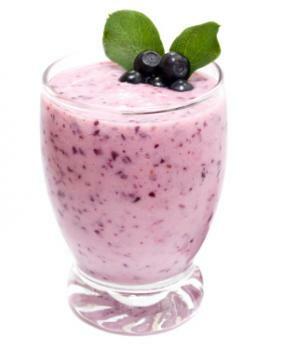 This delicious berry breakfast smoothie makes a delicious low-carb option. There are several ways you can vary this recipe. Make it a green smoothie by adding 1 cup of fresh, chopped spinach (add 7 calories and 1 g of carbs). Replace powdered egg whites with one scoop of unsweetened whey protein (add 2 g fat and 1 g carbs). Replace frozen blueberries with mixed berries (add 2 g carbs) or chunks of cantaloupe (add 6 g carbs). Many low-carbers really miss sandwiches. Eating low-carb, however, doesn't mean giving up the foods you love. Instead, you can make judicious substitutions to keep carb counts low. In this recipe, high-carb wheat bread is replaced by a sprouted grain bread, which is much lower in carbohydrates. Fry pepper bacon and drain on paper towels. Arrange tomato slices on bread. 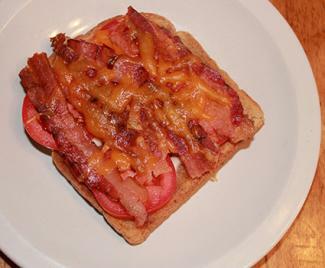 Cut bacon in half and place atop tomato slices. Sprinkle grated cheese over the top of sandwich. 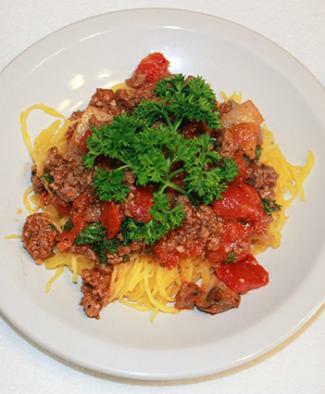 Here, this popular dinner favorite is made over into a delicious low-carb meal by replacing high-carb pasta with low-carb spaghetti squash. Cut the spaghetti squash in half and place on a baking sheet, cut side down. Bake until flesh is soft, about 30 to 40 minutes. While the squash bakes, brown Italian sausage in a large saute pan. Add onion and cook until soft and transparent, about five minutes. Add garlic and cook until garlic is fragrant, about 30 seconds. Add tomatoes, oregano, and salt. Bring to a simmer and simmer until squash is finished baking. Remove sauce from heat and stir in chopped parsley. Remove squash from oven. Take a fork and run it along the inside of the spaghetti squash. The flesh will come away from the rind in spaghetti-like strings. Divide squash into 1/2 cup servings. Top squash with sauce and add 1 tablespoon fresh grated parmesan to each serving. 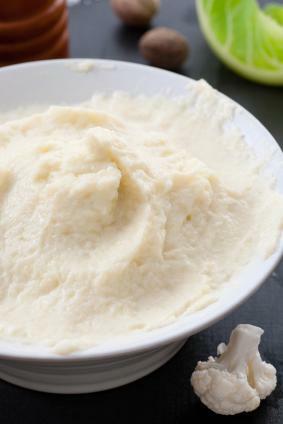 If you ever crave mashed potatoes, try this delicious side that mimics flavors and textures using cauliflower. You can also put cauliflower through a potato ricer to create "rice" to go with stir fries. A word of caution, however: if you're watching fat and calories as part of your low-carb lifestyle, this rich dish isn't for you. Drain cauliflower and place in a bowl with heavy cream and melted butter. Use a potato masher to mash to a potato-like consistency. Stir in cheddar, salt, and pepper. Sometimes, you just need something sweet. 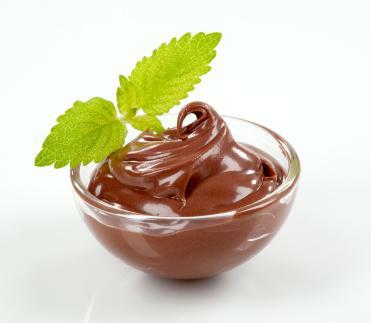 Use sucralose (Splenda) or stevia to sweeten this delicious mousse. Scoop avocado flesh into a food processor. Add coconut milk, cocoa powder, sucralose, vanilla, and salt. Process until smooth, stopping to scrape down sides occasionally. Living a low-carb lifestyle means learning a new way to prepare foods. Living low-carb doesn't have to be difficult, however. By stocking up on low-carb recipes, you'll be able to eat foods you enjoy while experiencing better health and wellbeing.